When is a Daphne not a Daphne? The beautiful Eriostemon (Philotheca) myoporoides 'White Lady' produces beautiful white star-shaped flowers which emerge from distinctive buds of apple-blossom pink. Its fragrance certainly rivals a Daphne and much like its contemporary, it also thrives in free-draining soil in a sunny, sheltered spot. Foliage emits a citrusy scent when crushed or touched, which makes it particularly useful as a cut flower - its scented tactile, waxy leaves are said to smell a little like Gin and Tonic. This beautiful, early flowering spring shrub will bring year-round interest to your garden with its evergreen leaves and clusters of gorgeous white, star-shaped flowers. Supplied already established in a 5L pot and ready to plant out on receipt and ready to flower from March. When you encounter the beautiful Eriostemon (Philotheca) myoporoides 'White Lady' you’ll understand its attraction. 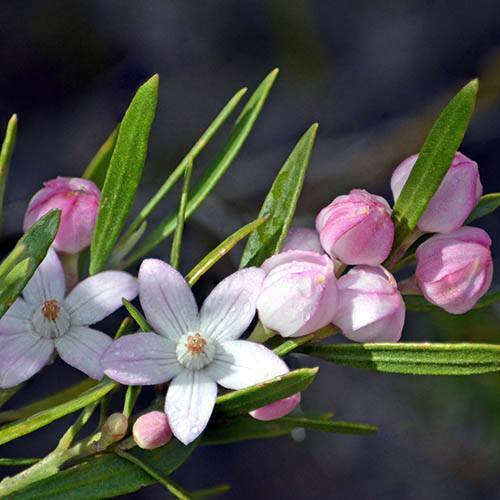 Going by many names including the Long-leaf Waxflower and the Australian Native Daphne, whichever name you prefer, this hardy evergreen shrub is a scented wonder, worthy of a place in any garden. From March to May, this compact, scented ornamental is awash with sparkling white, heavily scented flowers, which burst from delicate pink buds. Its fragrance certainly rivals a Daphne and much like its contemporary, it also thrives in free-draining soil in a sunny, sheltered spot. Notably, and in addition to its fragrant flowers, Philotheca foliage has glands that emit a citrusy scent when crushed or touched, which makes them particularly useful as a cut flower. Its scented tactile, waxy leaves are said to smell a little like Gin and Tonic and it's certainly an ornamental plant worthy of a place in any garden. A hardy, reliable plant that will grow happily in dappled shade, this beautiful, early flowering spring shrub will bring year-round interest to your garden with its evergreen leaves and clusters of gorgeous white, star-shaped flowers. Supplied already established in a 5L pot and ready to plant out on receipt ready to flower from March. Plants dislike root disturbance so consider carefully where you want it before planting. Plant out on receipt and prune to shape each winter. Prefers well-drained soils in full sun or part shade. Feed twice a year with a slow release fertiliser (once in spring and again in the autumn). Can be tip pruned after flowering to promote a bushy habit, however, if pruned too hard plants can be slow to recover. Once established the plant can withstand extended dry periods and is tolerant of frosts. Easy to maintain, it is usually not troubled by pests or diseases.